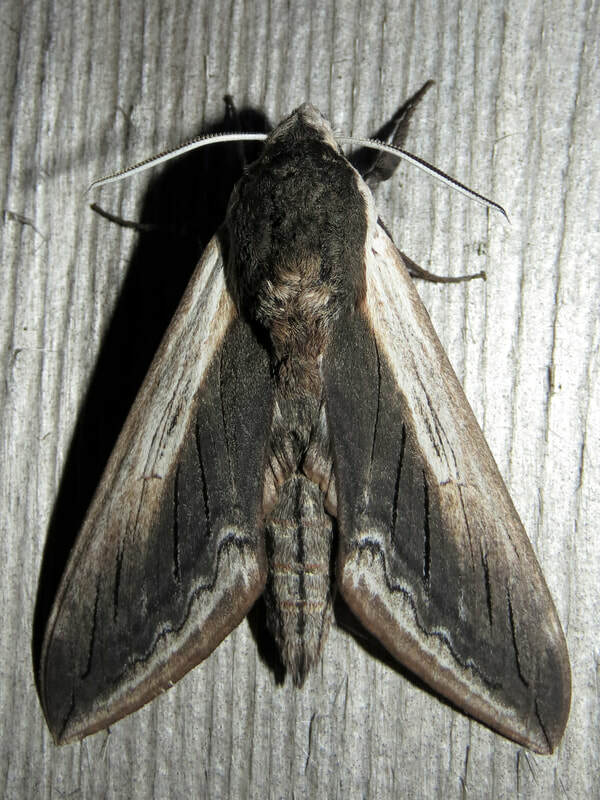 Ecology and Life History Overview: This is a moth that has been in decline in the Northeast (12). It has a very patchy distribution in the East, but it is far more common in the West. In the Eastern USA, I have noticed they seem to like pine barrens habitats, especially ones with lots of Prunus maritima (1). Sam Jaffe has found a fairly large thriving population in New Hampshire (11). 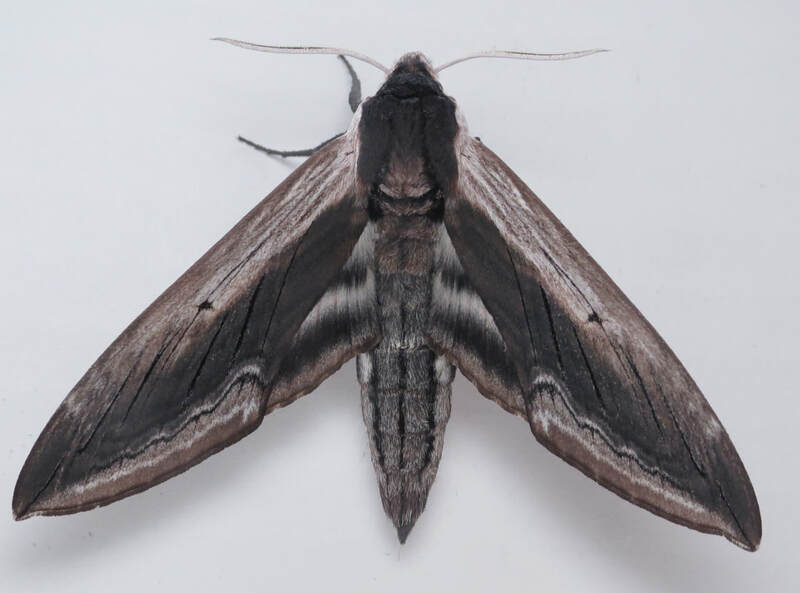 Adults seem to have a very long singular flight period, from May through July in the Northeast and caterpillars appearing in June through September (1). The flight times of adults are strange, they tend to come to light at various points in the night. I have seen them in the early evening, and also past midnight (1). Females lay eggs on various Prunus species including maritima and serotina, likely on the underside of leaves. Larvae eat in the tree, and are fairly camouflaged. Final instar larvae have a habit of stripping branches of their host, making them easily to spot (1). Searching for Larvae and Rearing Notes: Final instar larvae glow quite well under UV light, and make them quite easy to find. It is likely certain populations have distinct preferences for certain Prunus species. Females will lay in paper bags, and larvae are easy to rear on Prunus serotina on either cut food, or sleeving. Larvae should be kept well ventilated, but they don’t seem to mind being housed with other larvae (1). Larvae pupate extremely well in soil, or in the prefered method of placing larvae in a tub filled with a base layer of damp paper towels, then 3-4 layers of dry towel on top (1). This method tends to help prevent fungus/mold contamination. To store pupae over the winter, we recommend using a sealed tupperware container in the refrigerator with 3-4 drops of water in it. Layer in pupae in dry paper towels (1). Adult description: This is a medium-large (45-52mm forewing length) strikingly marked moth (2). The majority of the forewings are jet black. There is gray in the leading edge radiating along the wing margin from the thorax. This area may also have a fairly white streak in the middle. The black subterminal line separates the gray outer wing margin from the remainder of the wing. Like other members of this genus, the hindwings are black and gray striped. L3: At this stage, the larvae is fairly distinct and about 2.54cm (1). It is covered in white speckles, giving it a rough appearance. The thick, almost disproportionally large caudal horn is bright red and sticks straight back. 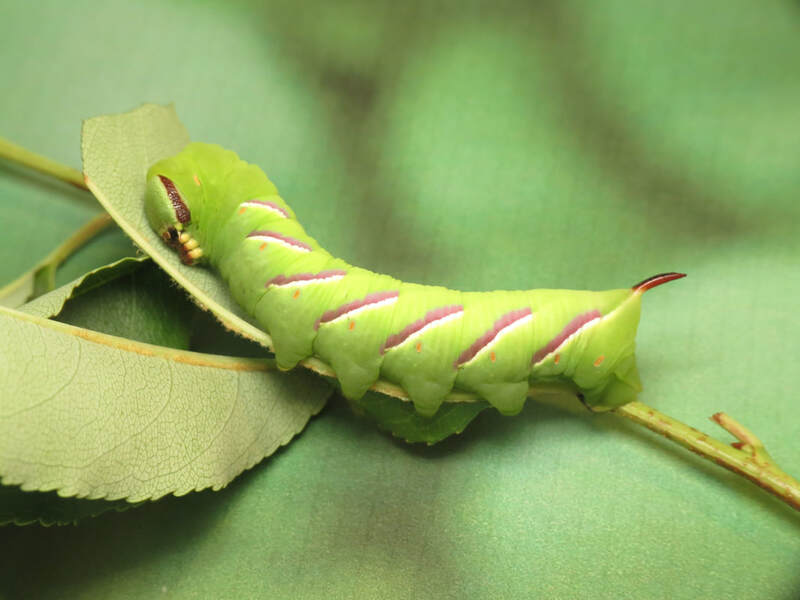 The ground color of the larva is bright green. There are 7 white diagonal abdominal stripes that are bordered by purple above. The spiracles at this stage are quite distinctively red. L5: A fairly robust large green caterpillar that looks similar to other Sphinx species. There are 7 white abdominal streaks bordered by a thick purple streak. The streaks are above the yellow-orange spiracles. 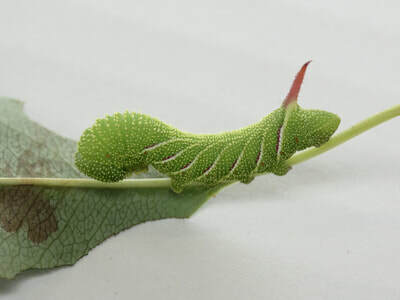 The larva of this species tends to be graduated in its ground color from a darker green-blue near the legs to a much more green color on the dorsal surface. The horn is red and pointed. The head capsule has parallel dark lines on it with a lighter green-blue color in the middle. The gallery to the left contains photos of Sphinx drupiferarum adults. If you have a photo that you would like to submit to us, please contact us. The gallery to the right contains photos of Sphinx drupiferarum larval and pupal stages. If you have a photo that you would like to submit to us, please contact us.